Sports participation is a major factor in the development for most children. Kids who play sports reap many benefits, including fitness, the ability to think critically and solve problems, opportunities to build self-discipline and create bonds with peers as well as develop leadership skills and coping strategies. Studies show that children who participate in organized sports are overall healthier than those who do not. Fitness: There are several health benefits of regular physical activity in childhood and adolescence. It improves strength and endurance, helps build healthy bones and muscles, controls weight, and may improve blood pressure and cholesterol levels. Physical fitness is one of the most obvious health benefits of exercise; however, organized sports have several other positive effects on your child's health. Eating right: Although sports can help improve your child's physical fitness, it is important for young athletes to eat right. Children need to eat a variety of healthy foods that include protein, carbohydrates, and vitamins. Caloric needs go up during puberty as well. Consult a dietitian to optimize the diet of your child. Psychological health: Playing a sport can contribute to your child's psychological well-being. Physical activity reduces anxiety and depression. Being part of an organized team can enhance self-esteem. Organized sports can make your child feel like they are a part of something. It builds character. 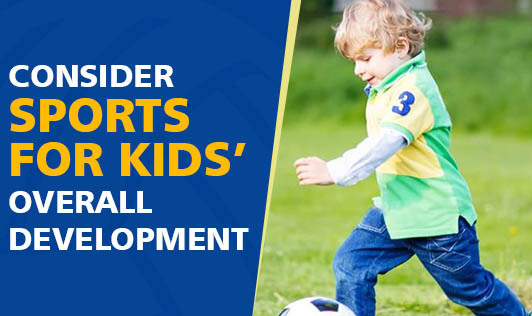 Playing sports can help your child develop a connection between mind and body by strengthening the body and using the mind to react. Sports improve academic and occupational outcomes, lower school dropout and deter delinquency. All of these things contribute to your child's overall health. Organized sport options: Be sure about the age-appropriate sports for your child. Toddlers between 2 to 5 years are too young for most types of organized sports. Unstructured free play is the best. Once a child is 6 or 7 years his attention span, ability to follow directions and concept of teamwork improves. Cricket, soccer, gymnastics or martial arts are good choices for organized sports. After 8 years of age, most sports are acceptable as long as the right precautions are taken. So let the kids play and stay healthy for their better tomorrow.